R Brown SLE Ltd understands that Good Engineering Practices (GEP) consist of proven and accepted engineering methods, procedures, and practices that provide appropriate, cost-effective, and well-documented solutions to meet user-requirements and compliance with applicable regulations. GEP underpins activities in the day-to-day operations and forward planning within the Laundry business. 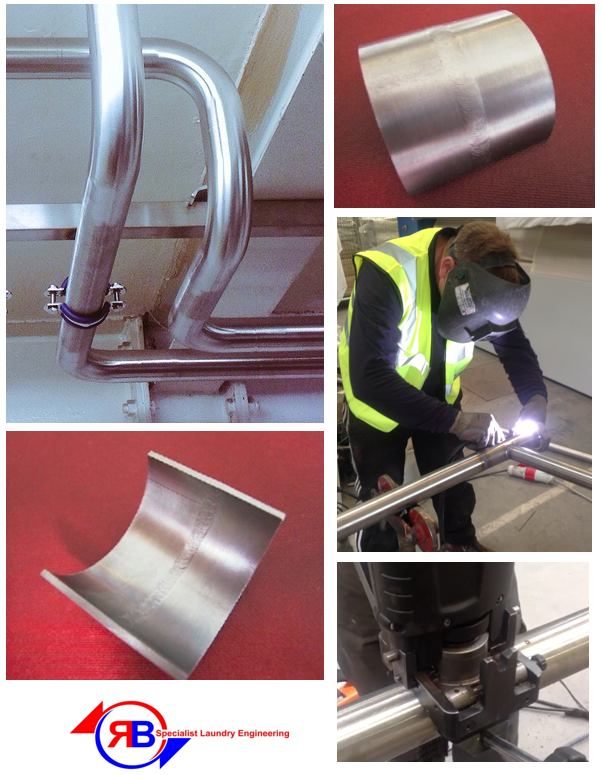 R Brown SLE Ltd uses purge welding techniques for creating seamless joints by removing, from the vicinity of the joint, oxygen, water vapor and any other gases or vapors that might be harmful to a welding joint as it is being welded and immediately after welding. Stainless steels, duplex steels are sensitive to the presence of air, oxygen, hydrogen, water vapor and other vapors and gases that may combine with the hot metal as it is being joined. Such gases may combine with the metal to form undesirable compounds that may reduce corrosion resistance or may be instrumental in creating cracks or other structural defects in metals. The following video shows the method of removing a tee section from a piece of stainless steel pipe.